As we near the end of our descent into Deep Gap things look very familiar. I remember that drainage over there, and yes, there’s the side trail to the Groundhog Creek Shelter. That’s the log I was sitting on when I met Remi and Snooze for the first time. And there are the remnants of the old logging road that fades into bushes and shrubbery about 100 yards from here. The woods are brown this time, not yet touched by spring’s first breeze. I, too, must look different than I did the last time I stood in this place, nearly 14 months ago. A lot has happened since then. 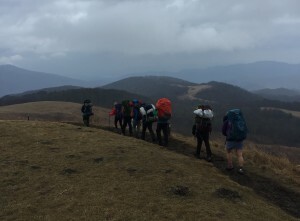 Our group, seven 10th graders from a semester school called The Outdoor Academy, drop their packs and begin searching for lunch. They go about meal prep in a way that’s surprisingly calm for a group who has only been on the trail for two days. I, on the other hand, am feeling overwhelmed with emotion. I ate lunch in this exact spot during my thru-hike and now here I am, leading a group of teenagers through the forest that cradled me for 4.5 months. My fascination with the Appalachian Trail began on a short backpacking trip I went on as a 12 year old at summer camp in western North Carolina. The instructors ignited my curiosity with fireside tales of people who walk the trail from end to end, carrying everything they need and nothing they don’t. The seed was planted then, and it grew relentlessly until I reached the summit of Mt. Katahdin last August. I feel as though I’ve come full circle now, guiding young people through these places that became meaningful to me so many years ago. I can’t help but wonder if the students are beginning to feel it, the attraction to this lifestyle. I’m more comfortable out here than I am in the city, but this is only the second backpacking trip many of these kids have ever been on. They are miles away from their comfort zones, and yes, it is starting to rain. Students come to The Outdoor Academy for the fall or spring semester of their sophomore year in high school. They quickly develop a tight-knit community focused on the principles of simple living, work ethic, curiosity, integrity, self-reliance, stewardship, and gratitude. During the week, students are engaged in rigorous academics taught experientially and often outdoors. The weekends are reserved for outdoor programming, including whitewater canoeing, rock climbing, and backpacking. While these activities are fun, they aren’t considered “recess”. They are, alternatively, an equal part of the curriculum at The Outdoor Academy. I’m excited to serve as an instructor for this semester’s first 5-day trek. I’ve worked for the same organization that operates The Outdoor Academy for over six years now, but I’m often busy this time of year working to recruit participants for our summer programs. Getting to step away from my desk and spend time in the woods with the students is really exciting for me. By day 4 we’re falling into an easy rhythm. The students are becoming more efficient breaking camp in the morning, and they pass the miles on the trail with stories and riddles. There are times while we hike when silence overtakes the group, and I feel each of them becoming more and more connected to the path they’re walking. They look up and marvel at the foggy woods surrounding them, learning to appreciate beauty that most people don’t have the opportunity to experience. I watch as a student stops and closes his eyes, filling his lungs with cool mountain air. He’s discovering his place here; it’s writing on his heart. My co-instructor, Becca, entertains us all with stories of her days working in the huts and on the trails in New Hampshire’s magnificent White Mountains. She, too, is intimately connected to the trail and committed to protecting it. Under her encouragement and with inspiration from the Packing It Out initiative, the group fills multiple bags with trash found along our route and carries them strapped to their backpacks. They’re leaving this place better than the way they found it. We arrive at the bus mid-morning on day 5. There’s chatter of hot showers and a home-cooked meal, of warm beds and cups of tea. As excited as they are to return to campus, I know they’ll remember this trek fondly. Tonight they’ll sit in the den with their classmates and exchange stories from the trail. They’ll try to explain inside jokes and laugh together, and when they crawl into their beds later on they’ll feel pride for having thrived in the wilderness for five days. “I did that”, they’ll think. I, too, return to my home and the comforts within. I go about unpacking, hanging up my damp sleeping bag and washing muddy clothes. Walking from room to room, I pause in front of the tall map of the Appalachian Trail that hangs in the hallway and stare at it for a few minutes. Springer, Hot Springs, Shenandoah, Harper’s Ferry, Delaware Water Gap, Mt. Greylock, Killington, The Whites, Mahoosuc Notch, The Bigelows, Monson, Kathadin. “I did that”, I think. I often ask myself how I can put the things I learned during my thru-hike into practice. Admittedly, there are times this question causes unease. Am I doing enough? Simply put, the experience was so good; I don’t want it to slip away. And then I find myself back on the trail with eight incredible people, helping facilitate an experience that will live in their memories and serve as inspiration for future adventures. I think back to the instructors that guided me into the woods twenty years ago and remember the things they taught me and stories they told. My 12 year old self believed that anything was possible after that short trek. I was strong and brave, and I could take care of myself in the wilderness. Without realizing it, they gave me the most important thing I carried on my thru-hike: belief in myself. Perhaps a spark or two was ignited on our 5 day trek. Maybe one of the students will embark on a thru-hike of their own someday, or maybe not. Regardless, I believe that each of them walked away with a little more confidence and the realization that they are capable of more than they can even begin to imagine. I’m walking away with something, too: the realization that I am exactly where I’m supposed to be. I recently read that sometimes life brings you full circle to a place you’ve been before just to show you how much you’ve grown. Unitl next time, peace be your journey.